Just imagine it, a luxurious room on an island, with chef-prepared meals and a view of the Statue of Liberty and the Manhattan skyline. 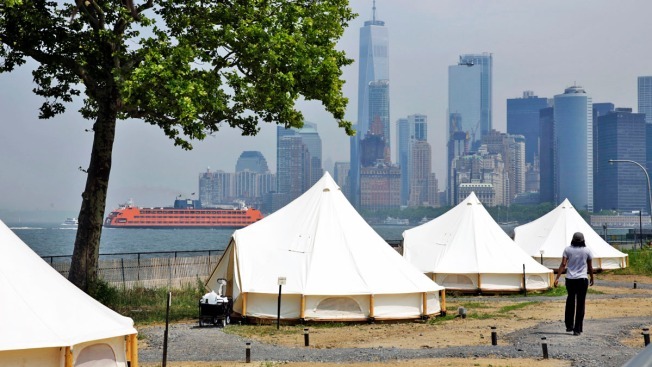 It's actually a campground of high-end tents on Governors Island, the latest outpost for glamping, or glamorous camping. Rates that can run more than $700 provide such creature comforts as full beds, high thread-count sheets, bathrooms, plush towels, electrical outlets, barbecue grills and an on-site restaurant offering prime cuts of meat. The location, Governors Island, is a 172-acre plot of land that sits just off the southern tip Manhattan, with stunning views of the city's Financial District, the Statue of Liberty and Ellis Island. Formerly used by the Army and Coast Guard, a portion of it is now home to a national monument overseen by the National Park Service, while the majority was transferred over to the city and state for the benefit and use of the public. "It's absolutely worth it because big-picture, this is the direction we need to go," Samuelian said.